A fire-saw is a firelighting tool. It is typically an object "sawed" against a piece of wood, using friction to create an ember. It is divided into two components: a "saw" and a "hearth" (fireboard). Two forms of the fire-saw have been documented in central and western Australia. One model is a split, notched stick as a hearth, and a knife-like hardwood stick as the saw. The other model makes use of the woomera weapon and defensive shield that natives carried. In the Philippines and Oceania, a fire-saw from bamboo pieces is common. A Kayan using rattan to "saw" a piece of firewood. A fire thong is a form of fire-saw, where a pullstring (usually wood fibre or rope) is used to saw. It is common in Southeast Asia and Oceania. ^ a b "Fire Thong". Primitiveways.com. Retrieved 2012-12-18. ^ "Firem'n Chit Course - Leaders Training Youth - Scout Resources". InsaneScouter. Retrieved 2012-12-20. ^ Davidson, D. S. (2009-10-28). "FIRE-MAKING IN AUSTRALIA". American Anthropologist. 49 (3): 426–437. doi:10.1525/aa.1947.49.3.02a00040. ^ Mark (2009-06-20). 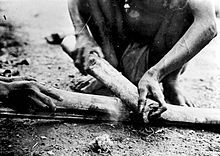 "Nehawka Primitive Skills: Bamboo Fire Saw". Nehawkaprimitiveskills.blogspot.com. Retrieved 2012-12-18. ^ "Fire Making". Jewishnaturecenter.org. Retrieved 2012-12-18.